"Many in legacy media love mass shootings," NBC News quotes NRA spokesperson Dana Loesch as saying Thursday at the Conservative Political Action Conference. "You love the ratings. Crying white mothers are ratings gold." A week after 17 people were killed at a school shooting in Florida, the NRA went on the defensive in speeches, videos, and statements targeting gun-control advocates, Democrats, the media, and even some ideas put forth by President Trump, the Washington Post reports. In his own speech at CPAC, NRA CEO Wayne LaPierre warned citizens to be "frightened" of any Democratic election victory. 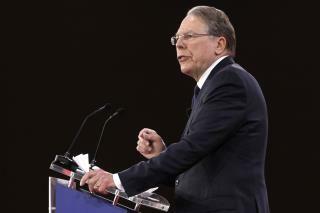 "What they want is more restrictions on the law-abiding," CNN quotes LaPierre as saying. "If they seize power ... our American freedoms could be lost and our country will be changed forever." "The NRA is once again spewing pathetic, out of touch ideas, blaming everything but guns." No, they're not blaming everything. They're not blaming themselves nor their 19th century wild west idiot-ality. Come on Wayne. The MSM tells us the problem is guns and White supreme guys. You are confusing our training.